Santorini or Thera is quite unlike the other Cycladic islands. The present form of the island is due to the sinking of the caldera and is surrounded by two other islands, Therasia and Aspronisi. Santorini has a 69 km (40 mi) coastline and is located at a distance of 130 nautical miles away from Piraeus. In the antiquity Santorini was known as Strongyle or Kalliste. Excavations have shown that island was inhabited during the Early Cycladic period (3200-2000 BC). The island's apogee (2000-1550 BC) was cut short by the eruption of the volcano in 1500 BC. The island was reinhabited around 1000 BC by Dorians. 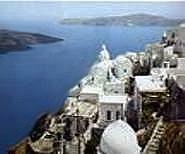 In 426 BC Santorini became a member of the Athenian League. From 1207 onwards the island belonged to the Duchy of Naxos and governed by several noble families. The island was the victim of numerous pirate attacks and destroyed by Barbarosa. In 1579 it was taken by the Turks. During the 19th century economy flourished based on shipping and Thera's contribution of vessels to the 1821 Struggle for Independence was significant. Excavations begun in 1967 and an entire city was revealed. Houses, workshops, streets, squares remained burried beneath the mantle of pumice and ash. Pottery, stone tools, vessels, minor objects, bronze tools are exhibited in the Archaeological Museum in Athens. Must see: From the landing-place Skala, we can climb up to Fira, the capital on foot or on donkey-back.There is a funicular railway for those who wish to avoid the hundreds of steps. Fira is very attractive, with winding narrow streets, arcades, and a quarter where the Catholic nobility once dwelt. There is a most important Museum, with prehistoric finds (mostly pottery), a large collection of vases dating from the 7th and 6th centuries BC (including the pieces known as 'Thera ware'), a few Archaic and Classical pieces, and some Hellenistic and Roman sculptures and portraits. The striking landscape, the peculiarities of the natural environment, the unusual architecture and the outstanding monuments of Santorini attract very large numbers of visitors in the summer-so many that the excellent tourist amenities of the island can only just cope with them. Among the best bathing beaches-some of them with black sand and others with pebbles - are Kamari or Armeni, Amoudi, Baxedes, Perissa and Kokkini Paralia.